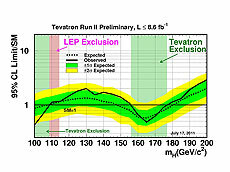 The combined Tevatron results exclude the existence of a Higgs particle with a mass between 100-108 and 156-177 GeV/c2. Scientists of the CDF and DZero collaborations at Fermilab continue to increase the sensitivity of their Tevatron experiments to the Higgs particle and narrow the range in which the particle seems to be hiding. At the European Physical Society conference in Grenoble, Fermilab physicist Eric James reported today that together the CDF and DZero experiments now can exclude the existence of a Higgs particle in the 100-108 and the 156-177 GeV/c2 mass ranges, expanding exclusion ranges that the two experiments had reported in March 2011. Last Friday, the ATLAS and CMS experiments at the European center for particle physics, CERN, reported their first exclusion regions. The two experiments exclude a Higgs particle with a mass of about 150 to 450 GeV/c2, confirming the Tevatron exclusion range and extending it to higher masses that are beyond reach of the Tevatron. Even larger Higgs masses are excluded on theoretical grounds. 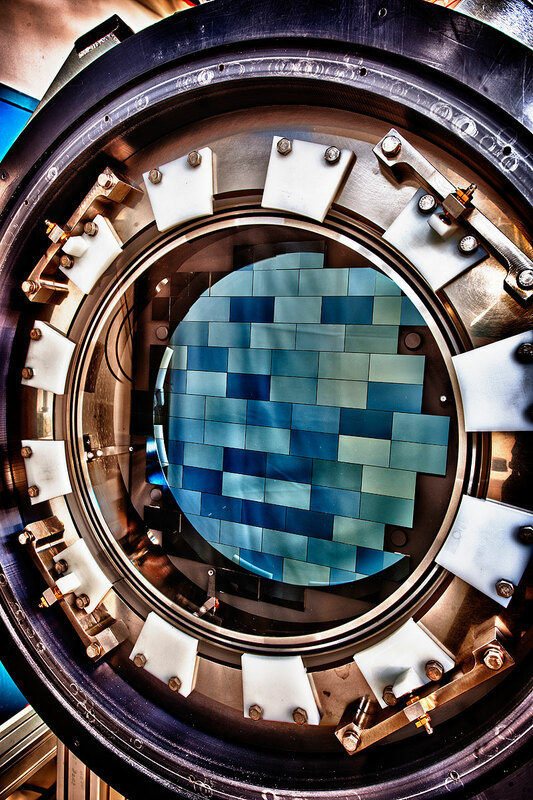 This leaves a narrow window for the Higgs particle, and the Tevatron experiments are on track to collect enough data by the end of September 2011 to close this window if the Higgs particle does not exist. 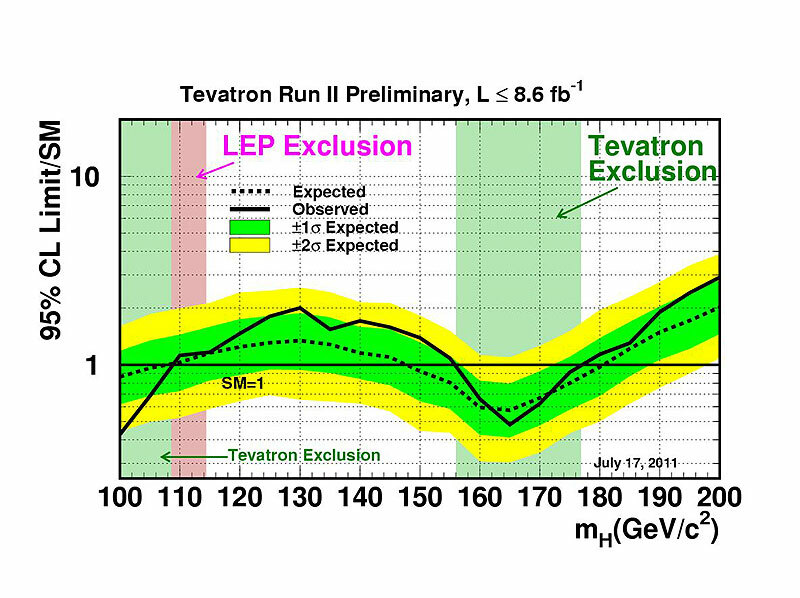 James reported that the Tevatron experiments are steadily becoming more sensitive to Higgs processes that the LHC experiments will not be able to measure for some time. In particular, the Tevatron experiments can look for the decay of a Higgs particle into a pair of bottom and anti-bottom quarks which are the dominant, hard-to-detect decay mode of the Higgs particle. In contrast, the ATLAS and CMS experiments currently focus on the search for the decay of a Higgs particle into a pair of W bosons, which then decay into lighter particles. Mark your calendars! ES&H is rolling out its third annual “Accelerate to a Healthy Lifestyle” program which kicks off on Aug. 1. The event will run from Aug. 1 through Oct. 31. The goal is to exercise a minimum of three days per week for 30 minutes (i.e., walking, running, tennis, swimming, biking, hiking, etc.). For more information, please visit the ES&H webpage where you can join and enter your time electronically. 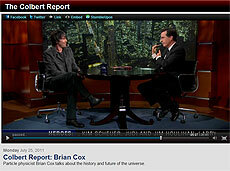 Professor Brian Cox, an ATLAS collaborator from the University of Manchester, tries to explain the Higgs boson, among other elements of physics, to comedy talk show host Stephen Colbert. Cox explains why scientists at CERN and Fermilab are searching for this mysterious particle. 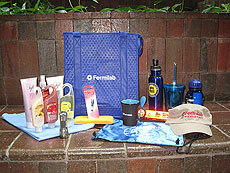 Go to the 4:48 mark for Fermilab's mention. The latest results from Europe's Large Hadron Collider have raised hopes among particle physicists that the elusive Higgs boson — also known as the "God Particle" — may be coming to light at last. Sure, we've heard that before: Rumors about a possible detection at Fermilab's Tevatron, a particle collider near Chicago, have been circulating since last year, and just in the past few months there's been a rise and fall in expectations that the Higgs would turn up in the Tevatron's data. Now the potential signature of the Higgs boson has turned up in an avalanche of data from both of the Higgs-hunting detectors at the Large Hadron Collider. The signature is not yet clear enough to constitute a discovery, but it suggests that the $10 billion particle collider, arguably the biggest and costliest science experiment on Earth, just might be on the right track. "We cannot say anything today, but clearly it's intriguing," Fabiola Gianotti, spokeswoman for the science team behind the LHC's ATLAS detector, told The Guardian. Similarly intriguing results were reported by the team for the other detector, the Compact Muon Solenoid or CMS. Nancy Grossman, head of the ES&H section, wrote this week’s column. ES&H is part of everything we do, whether we realize it or not. We don’t often realize the impact we have on our own safety, health or the environment as we drive to work or shop for groceries. We frequently operate on autopilot, doing things as we have always done them. But all the little choices we make can affect our health and the environment and, sometimes, even our safety and that of others. Our schedules and budgets are tight, and times seem very uncertain. It is under these circumstances that we are more likely to make poor choices or simply not think about the choices we are making. Yet it is under these circumstances that we must be even more careful and pay attention. If you see a flaw in a work process or you know how the process can be improved—say something. Share your good ideas. Help coworkers make good choices. Support each other. Join our “Accelerate to Healthy Lifestyle” program with a friend to relieve stress, while improving your health and your friend’s health. Fermilab’s greatest strength is its people. The science is interesting, but the people make it fun. Let’s continue to share our good ideas and concerns to improve ES&H and our science program. So slow down, Take 5, look at what is going on around you, think about how you can improve what you are doing, both at work and at home. And then share your ideas. We can make it through these trying times, while continuing to be first in science and safety. This week's safety report, compiled by the Fermilab ES&H section, includes one recordable incident, two incidents requiring first-aid treatment and two additional incidents. One employee received a laceration on his finger when he caught his hand between two objects while moving a lifting fixture. He required sutures to close the laceration. Two separate employees were stung by wasps and required first aid treatment. One employee tripped and fell, resulting in a disloacted finger. He set the finger himself and did not require first aid treatment. Another incident involved a vehicle accident, but no one was injured. Creative writing group - every other Thursday Jul. 28 through Aug. 25 in WH4SE "Abacus"